This week’s challenge for the bakers is Patisserie Week, which means they’ll be making an array of fancy French delights. Our skills by this point in the competition are pretty limited. Turns out we’re better at the booze stuff than the baking, so this week’s recipe is nowhere near as fancy as those creations in the tent. But, if you want a fairly simple office/party pleaser with delicious Cherry Brandy in then you have come to the right place. Here’s how to create 16 mini cherry tarts with a Cherry Brandy creme patissiere. First, make your pastry cases. Heat oven to 190C/170C fan/gas 5. Divide the pastry into 16 equal pieces. Roll out each one to line a 7-8cm deep fluted tartlet tin and trim, leaving a little pastry sticking up above the tin. Line each one with a paper cake case and add a layer of baking beans. Put on a baking tray and bake for 10 minutes, then remove the paper and beans and bake for a further 5 minutes until the pastry is golden. While the pastry is cooling, make your creme patissiere. First, beat the egg yolks and sugar for a few minutes until pale and the consistency has slightly thickened. Next, whisk in the flours until fully mixed with the eggs and sugar. In a saucepan, heat the milk until it starts to boil. Take it off the heat and pour into the flour and egg mix and whisk together. Put the whole mixture back into the saucepan and heat, constantly stirring. Only remove when it’s thick and boiling, but smooth. Cover with clingfilm and leave to cool. Once it’s cooled, transfer into a bowl and add in your Cherry Brandy. Stir in. Use a teaspoon or piping bag to put the cream in the tartlet cases. Top with a cherry on each, and enjoy! 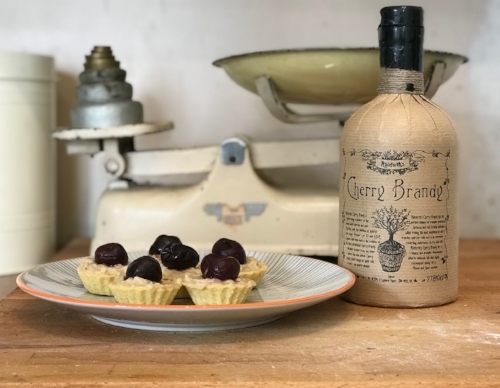 Bread week and Cherry Brandy…what’s not to love? 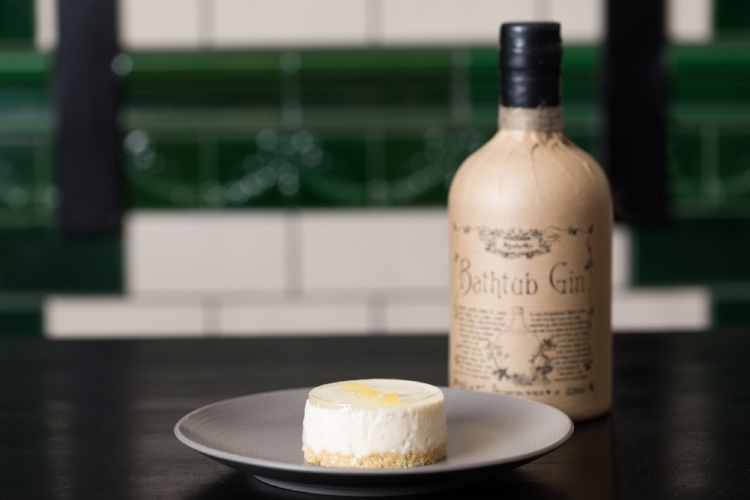 ﻿Now that we’re in week three of The Great British Bake Off, it probably comes as no surprise that we enjoy sweet treats, especially when they’re infused with our range of spirits. And this week is no exception - for Bread Week we’ve baked a batch of Belgian buns…but with a Cherry Brandy shaped twist. Adding Cherry Brandy really is the um, cherry on top of the cake (or bun, if you will). Sure, you could have regular icing, but would it be as flavoursome? Probably not. Adding the Cherry Brandy makes the classic Belgian bun the grown-up iced treat you probably didn’t know you needed or wanted…until now. In the spirit of sharing, we baked these and brought them in to Ableforth’s HQ, and they were wolfed down so quickly there was barely time to boil the kettle to make a nice ol’ cup of tea to accompany. Warm the milk to hand hot in the microwave (around 20 seconds). Add a pinch of sugar and the fast acting yeast. In the centre of the bowl make a depression and add the egg and the yeast/milk mix. While you wait, mix 4 teaspoons of your Ableforth’s Cherry Brandy in to your jam. Spread with the Cherry Brandy jam and then sprinkle on the handfuls of raisins. Roll up the dough to along the thick end similar to how you would roll a Swiss roll. Mix the icing sugar with enough cherry brandy to make a smooth paste which can be spooned onto the buns. On your marks, get set...rum! It’s week two of the Great British Bake Off and that means it’s...CAKE WEEK. This week, the bakers in the famous tent will be creating traybakes as one of their tasks, so we took on the challenge ourselves, and have come up with recipe we think you’ll like. Plus, the great thing about a traybake is it’s a real crowd pleaser, so if you need to impress at a birthday or make office friends, just throw together this booze-filled bake and you’ll be the star baker in no time. Grease your tin (we used a 13”x 9” roasting tin for this) and line with parchment paper. Preheat the oven to 160c or gas mark 3. Measure all of your cake ingredients apart from the Rumbullion! and add them to a mixing bowl. An electric mixer is best, or you can mix by hand if preferred. Mix for around a minute, then slowly add your rum. Continue to mix for another minute, or until the mixture is smooth. Pour your mixture into your tin and level out. Then put in the oven and bake for 30-40 minutes. While the traybake is in the oven, make your frosting. To do this, grate your limes and put the zest aside. Then combine the butter, icing sugar, lime juice and rum in a mixer for around two minutes. Put put in a bowl and refrigerate for half an hour. Once your sponge has cooled and your frosting is set, spread the frosting on top, sprinkle the lime zest over, slice up and enjoy!